The Diagrams shown below represent a few examples of how Rhine Airs Portable Ventilating Equipment can be used to purge Aircraft Fuel Tanks and supply continuous air circulation to support safe entry by personnel. 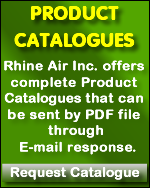 Rhine Air can provide additional product set up diagrams and use recommendations for specific Aircraft and Rotorcraft Models. Please contact us for further details.